A study of the fulfillment of an important prophecy in the book of Daniel helps prove the Bible’s claim to be divinely inspired. The Bible is a collection of writings considered authoritative for doctrine and practice by the Christian faith. How can a person living in the 21st century trust a book that is made up of smaller books written by so many different writers over such a long period of time, without the benefit of independent, external corroboration of the facts it presents? We can trust the Bible because its words have been confirmed by the God of the Bible through the instrument of fulfilled prophecy. There is Someone (who identifies Himself as the LORD, the Creator and the God of Israel) speaking through the pages of the Bible who claims to be the only true God and to be able to “declare the end from the beginning.” That means He can foreknow and foretell the future as a proof of His deity. And He challenges anyone claiming to be a god to prove it by matching Him in this capability (Isaiah 46:9-10; 41:21-24). We will demonstrate a test of this claim by the use of some prophetic and historical data. If the prophecy was fulfilled, then God’s claim is true; if the prophecy was not fulfilled, then His claim is not true. We will use this test to help prove that the Bible can be trusted as a source of divine revelation and historical facts. Head of gold: Babylonian Empire under Nebuchadnezzar. Chest of silver: a second kingdom after Nebuchadnezzar. Belly and thighs of bronze: a third kingdom. Legs of iron and feet of iron mixed with clay: a fourth kingdom. Stone cut out without human hands: a kingdom set up by the God of heaven. The stone strikes the statue at its feet and destroys it: the Kingdom of God destroys all previous kingdoms. The following is a brief synopsis of how these events actually played out in history. 530s B.C. : Approximate dating of the book of Daniel. Josephus cites the book of Daniel as having been shown to Alexander the Great during his conquest of Palestine in 332 B.C. (Antiquities 11:8:5).This helps confirm that the book existed long before the rise of the Greco-Macedonian Empire. 612-539 B.C. : Babylonian Empire (fulfillment of the head of gold). 539-331 B.C. : Persian Empire (fulfillment of the chest of silver). 333-63 B.C. : Greco-Macedonian Empire begun by Alexander the Great (fulfillment of the belly and thighs of bronze). 31 B.C.-A.D. 476: Roman Empire (fulfillment of the legs of iron) (Unger’s Bible Dictionary, 1985, pp. 203-204). These commonly known, established facts of world history prove the accuracy of the prophecy through the fall of the Roman Empire in A.D. 476. No human living at the time of Nebuchadnezzar could have predicted the rise of these empires that succeeded the Babylonian Empire. The fact that the fifth empire, representing the Kingdom of God, is prophesied to confront and conquer the Roman Empire implies that the Roman Empire would undergo a series of resurrections down through time until the “latter days” or the end time when Christ will return. The fact that the fifth empire, representing the Kingdom of God, is prophesied to confront and conquer the Roman Empire implies that the Roman Empire would undergo a series of resurrections down through time until the “latter days” or the end time when Christ will return. As shown below, this is exactly what has happened in history so far: The Roman Empire did continue to exist in the form of a series of imperial restorations down to our time. 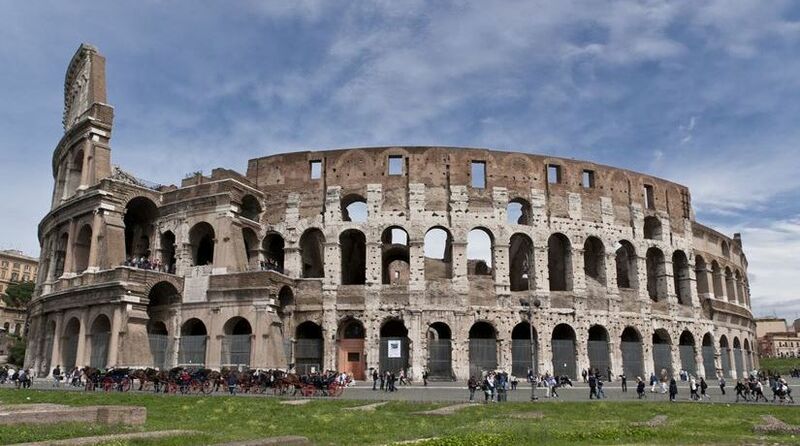 And the stage is set for yet another imperial restoration of the Roman Empire. These predictions are clearly supernatural. A.D. 476: The Roman Empire fell at the hand of the barbarians, leading to a period of three Arian kingdoms ruling Catholic Rome. 1273: The Roman Empire was revived under Rudolf of Habsburg (also spelled Hapsburg). In 1530 Charles V, the greatest of the Habsburg emperors, was crowned Holy Roman emperor by Pope Clement. 1804: The Roman Empire was revived under Napoleon Bonaparte. At his coronation ceremony conducted by Pope Leo III, Napoleon crowned himself Holy Roman emperor. 1936: Building on the efforts of Garibaldi in the previous century to establish modern Italy, Benito Mussolini rose to power and annexed Ethiopia, proclaiming another resurrection of the Roman Empire: “Salute, after fifteen centuries, the reappearance of the empire on the fated hills of Rome.” Some of Mussolini’s supporters call him “divine Caesar” (Keith W. Stump, The History of Europe and the Church, 1984). The historical evidence covered above leads us to the following conclusion: The prophecy was fulfilled; therefore, God’s claim is true. There is a being speaking through the book of Daniel and the Bible as a whole who is who He claims to be—the only true God. He is capable of declaring the end from the beginning (foreknowing the future) by the order of thousands of years. The Bible is a trustworthy source of communication from that God to man. Second, the fact that the majority of the prophecy has so far been fulfilled means that the fulfillment of the remainder is as certain as the rising of tomorrow’s sun. That is, another restoration of the Roman Empire in Europe is yet to occur and Christ will confront and conquer it (as symbolized by the stone striking the feet of the statue).